Town In Hawaii Prepares For Possible Evacuation Ahead Of Lava Flow : The Two-Way On the state's Big Island, the town of Pahoa is packing up to leave if the flow from Mount Kilauea continues its advance. 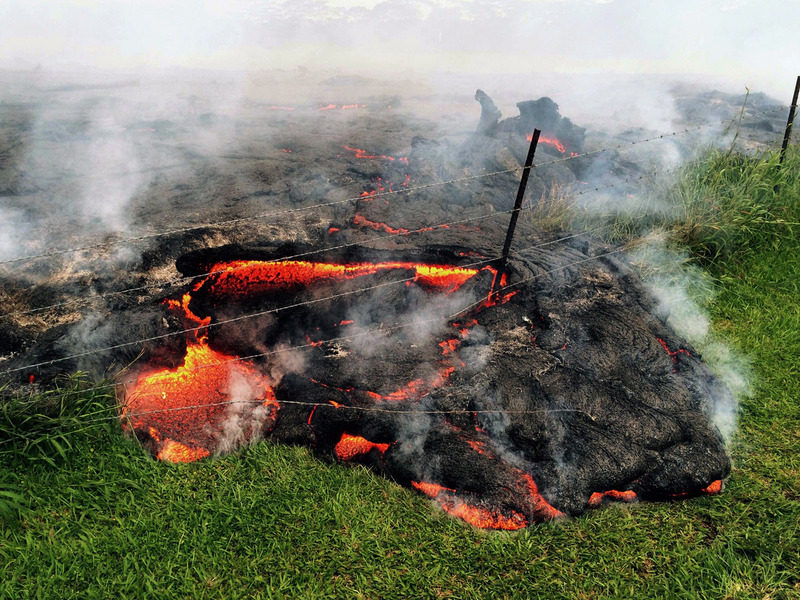 A lava flow advances across the pasture between the Pahoa cemetery and Apaa Street, engulfing a barbed wire fence, near the town of Pahoa on the Big Island of Hawaii on Sunday. Creeping lava from Mount Kilauea on Hawaii's Big Island is burning a path ever-closer to an area where residents have been warned that they might have to quickly leave their homes. The lava is moving about 10 to 15 yards per hour, officials say. "Hawaii County Civil Defense closed Pahoa Village Road as a fast-moving finger of lava moved to within 600 yards of the main street of Pahoa town. "Residents in the immediate downslope path of the lava were also urged to prepare to evacuate Sunday night, and the Red Cross opened an emergency shelter at the Sure Foundation Church in Keaau. "The closure of the road, at 9:30 p.m., limits use of the road to residents only. Others are being told to use the newly constructed Highway 130 bypass." In The Path of Lava, Part 1: Pahoa Families Pack Up. Dozens of residents in the path of the flow have been told to be on the ready to evacuate by Tuesday. The Associated Press says the Red Cross is opening a shelter to aide possible evacuees. "Kilauea volcano has been erupting continuously since 1983. Most lava from this eruption has flowed south. But the lava has flowed to the northeast over the past two years. "The current flow that has been threatening Pahoa began in June. It's been moving toward town in fits and starts for weeks, speeding up and then slowing down."